Southern Evangelical Seminary (SES) offers students something that cannot be found anywhere else – resident and online education programs that integrate classical philosophy, apologetics, and theology for a comprehensive and coherent world view. We are convinced that one of these disciplines without the other does not adequately unveil the beauty that is the historic Christian faith. As such, every class at SES, regardless of the subject, builds upon the other to form a complete and systematic view of reality and essential Christian doctrine. In addition, we believe that apologetics is not just important; it is critical to Christian evangelism today. SES not only offers the most apologetics degrees available, but apologetics and evangelism are woven into every class taught. 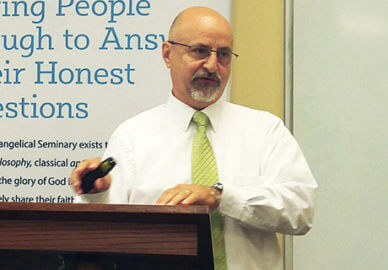 The mission of SES is to “train men and women, based on the inerrant and infallible written Word of God, for the evangelization of the world and defense of the historic Christian faith.” Given our philosophical distinctives, we believe sensible reality (i.e., general revelation) is the first truth man comes to know via his intellect. This knowledge is then combined with, and provides the tools for properly understanding, authoritative special revelation given by God (i.e., the Bible). Together, these two revelations, general and special, give us the understanding needed to see the truth of Christ’s work on the cross and the confidence to place our trust in Him as Savior. SES is committed to the “Geislerian DNA” of this approach as we equip believers to effectively, persuasively, and lovingly engage an increasingly hostile culture with the Gospel. Central to this purpose is the provision of a biblical basis and an academic understanding of our commitment to Christ. SES provides an educational opportunity where the Christian world view is both a framework for thinking and a dynamic for living. An undergraduate degree in Religious Studies and graduate and doctorate level degree programs specializing in Apologetics, Biblical Studies, Philosophy, Church Ministry, and Religion are offered. The goal of the SES faculty is to cause the student to discover truth in whatever context this discovery applies: biblical studies, theology, philosophy, or apologetics. The ideal student produced by SES will possess a love of the truth and the pursuit of the intellectual life, coupled with a love for God and growth in godly character. In so doing, SES will have prepared its students to defend the historic Christian faith and evangelize the lost.